Introducing JET - Marco Beverage Systems Ltd.
Playtime, in a business which competes on product innovation, can be enormously beneficial. I don’t mean xboxes and bean-bags, but something closer to pure research. In other words: engineering-led explorations without a clear path for commercialisation. This relies on a level of trust between the business and the engineering department, after all this activity is a de-facto investment, it costs money in direct terms and in indirect terms (lost opportunity of not doing something else). It isn’t always successful, some ideas fail, naturally – but an organisational belief in the importance (or potential returns) of this activity is, well… important. When I look at our current and future product releases, many core technologies we are deploying owe their existence to these roots. How does this relate to our current discussion? Well, we are launching a new coffee brewer at HOST, which we are pretty excited about. JET is a new platform for us which realises everything we have learned about hot-water management and coffee preparation into what we consider the most precise, energy efficient, and operator-focused system for brewing coffee in the market. The core technology inside has origins in a playtime product, which hasn’t been released to market, the Pillar, as well as a prototype version of our Filtro Shuttle line of brewers that most people would not have seen. At its core, it is a filter coffee brewer, and you can if you wish, use it in more or less the same way as any other machine (programme a water dispense amount, and press “go” when required). As an aside, you can view our range of coffee brewers on the website. JET can also be deployed with a grinder slave. 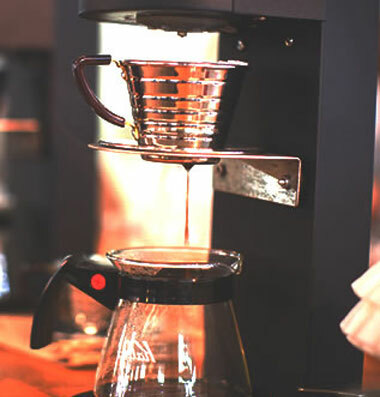 In this mode, brewer and grinder are first calibrated, the operator/installer sets up the desired coffee to water ratio, and the liquid lost ratio (water absorbed by the coffee in the bed), and thereafter the operator merely asks for the desired beverage amount. The brewer controls the rest, and guides to operator through the required actions. This small detail, coupled with precise water delivery (temperature and volume), greatly reduces potential for user error, delivering a consistent end-product, whilst also being operationally sympathetic. It also happens to look good, have a small counter footprint, and have low energy consumption. There are other features and benefits, rather than exhaustively waffling through them, come see for yourself at HOST, touch, feel, brew (have a look at the video at the end of this post). Each of these categories has different commercial drivers, varying visibility of return and varying time-cycles of return. As a business, the now or very soon return is often most tantilising, and certainly it is important. The long term vision, of product range development and roadmap tends to be more medium to long-term, but the justification is concrete, the returns are tangible. The playtime stuff generally has little visibility of return, has no guarantee of return, time-scales are completely unknown, risk is high. The danger is that if an organisation doesn’t have a deep belief in this type of investment and a trust in the competencies of those doing the exploring that it just won’t happen. So it’s all about balance – and an imbalance in the other direction is also something to be guarded against. Finally, it would be remiss to give the impression that all innovation happens in this context. Learnings and discoveries of course potentially materialise in the context of any new product development. There is an argument that the best innovation happens within tightly defined bounds. I see merit in that argument, but the two sides in my mind are different platforms for innovation, a different mindset, both delivering. In my experience, playtime provides a great platform for fundamental changes to core technology, potentially enabling step-changes in form and functionality.